Japan's social security system are roughly divided into four component pillars: social insurance, social welfare, public assistance and public health. The core social insurance is a compulsory system that ensures the livelihood of citizens by providing a given amount of cash or in-kind benefits in case of "events insured against, " namely, disease, injury, childbirth, death, old age, disability, loss of job, etc. Within this framework, a universal healthcare insurance system extending to all citizens has been set up in accordance with the National Health Insurance Act so that anyone can obtain appropriate healthcare anywhere at any time. 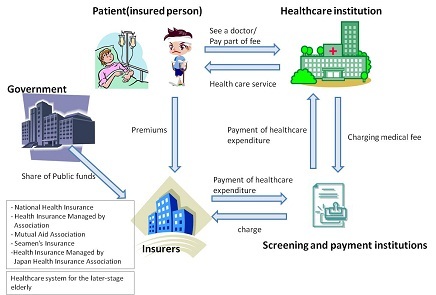 Japanese citizens have to be covered by any of the following medical insurances: 1) employee's health insurance for employed individuals, 2) national health insurance for self-employed individuals and those out of employment, and 3) the healthcare system for later-stage elderly for the people aged 75 years or older. In the medical insurance system, the insured pays a given amount of money every month to the insurers, and in case of a consultation pays part of the costs of the received healthcare services to the healthcare institutions. Healthcare institutions claims medical fee to the screening and payment institutions and receive the payment from insurers. Healthcare expenditures are paid on a fee-for-service basis. Medical fees for which healthcare institutions claim are figured out by counting the points of the individual medical practices. *Although the healthcare system for later-stage elderly people was introduced in FY2008, there has been keen dissatisfaction with the application to persons aged 75 or older, the high premiums etc. At present, it is under consideration to abolish this system and to establish a new sustainable system that covers all citizens. With the sophistication and advancement of healthcare as well as the emergence of an aging society with fewer children, it has been essential to respond to the changes of healthcare structure, the changes in disease structure, the diversified citizens' needs, and the steep rise in healthcare expenditure, etc. Under these circumstances, efforts are made to improve the expertise of each healthcare profession and promote team medicine for enhanced coordination to provide quality healthcare services.